I’m going to admit something here that I’m not proud of: I used to be a *boo boy*. It’s okay though, honestly. It was simply borne out of young frustration and I stopped many years ago. I’m sure some of you reading this boo Norwich City every so often and, quite frankly, they do sometimes deserve it. I even understood the few boos after City’s defeat to West Brom last week. 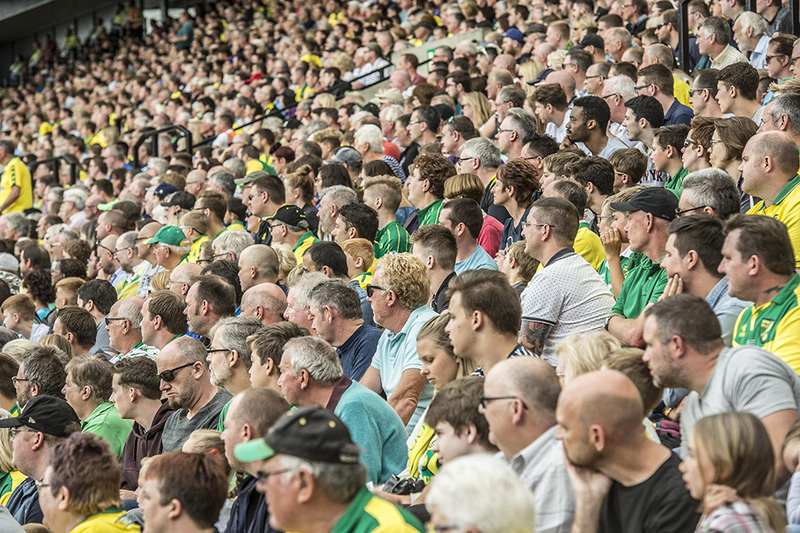 Yes, it was our first home game of the season but Norwich did what they have done so many times and snatched defeat from the jaws of victory. It was frustrating and hard to take. Before the pitchfork-laden mob arrive at my door, I should also point out that I know every fanbase does this and, actually, several are clearly much more irritating even at a distance. It’s common in the Premier League now to see a player from the big six clubs slide in front of his supporters after scoring just for them to take their phones out and take a picture – a worse crime than booing. And even that isn’t half as irritating as Arsenal Fan TV. And every crowd, in every division, in every country, in every sport, definitely, definitely boos. Norwich fans are no different and it annoys me when I see City fans on Twitter acting like we have an especially bad fanbase – we don’t. But on Wednesday, this belief was tested with every moan, groan and heckle that greeted a large percentage of Norwich’s by now well-known possession-based game. Here’s the thing: just over a year ago, we hired Daniel Farke as our manager after Norwich fans, rightly, demanded change. We had too many washed up players at the club that were too old and on too much money. Most fans accepted this change would likely result in a disappointing first season, and it did. This summer, we brought in more players to suit Farke’s managerial philosophy and to give him the best chance of succeeding. Everyone knew how we played football last season. Everyone knew it wasn’t going to drastically change this season. Not that Norwich played particularly well against Preston. Tettey was bad, Leitner ineffective at times, Hernandez faded and Rhodes just couldn’t get a sniff, through no particular fault of his own. I wouldn’t go so far as to say our patient play was rewarded but Farke did say post-match that he had deliberately intended for City not to be so gung-ho last night, in pursuit of our first clean sheet. And so for me, the game plan worked. Norwich didn’t concede, rode a brief Preston storm midway through the second half, then won the game. The winning goal originated from a short goal kick in which play was switched to our right centre-back, which gave Jamal Lewis space on the opposite flank. A punt up the pitch from the goal kick wouldn’t have allowed the City left-back the space to do what he then did. Besides, it’s becoming increasingly clear that, even if it didn’t come off too much the other night, City are trying to be more direct. Hernandez truly had the beating of his full-back in the first half and Norwich exploited it well, for instance. Leitner should have scored late in the first half through that particular avenue. Farke’s side are still happy to keep possession – they don’t have the players now to do otherwise – but have evolved to move it forward quicker and with more purpose – something they’ll have to do tomorrow against the high press of Leeds. The hope now is City keep developing. We’ve scored eight goals in four games without the remarkable talents of James Maddison. But we’ve conceded eight too. On paper, we finally got the balance right against Preston, but I don’t wear yellow-tinted glasses all the time – I know Wednesday’s game could have ended goalless fairly easily. In fact, it was the kind of game that last season would have ended goalless, but perhaps we now have the quality – including the so-far-excellent finishing of Teemu Pukki – to turn those draws into wins. I certainly believe we do. Yes, this particular win came at the expense of 75 minutes we’d all rather have back, but, with Norwich City, for better or worse, things are rarely boring for long. Yes Jack, I was at the game on Wednesday and really didn’t understand the need for some fans to boo at half time. As you say, it had been a dire 45 minutes of football, but we had somehow kept Preston at bay and contrived to blast a clear cut chance over the bar – but booing – WHY???? Tettey was culpable for West Brom’s 2nd goal a couple of weeks in our previous home game and came perilously close to repeating the process against PNE, but luckily Robinson’s shot crashed back into play from the underside of the bar. Ok, Tettey redeemed himself slightly by scoring our 2nd goal, but I’d still prefer to see either Thompson or Godfrey in the starting 11 for the visit of ‘high-flying Leeds and I know several fans feel the same. I particularly agree with your analysis of the build-up to the Pukki goal. Spot on. We would have got the cards or pokey dice out around the 20 minute mark if we’d had any, but booing? When the owners sell the best players and replace them with freebies in a desperate attempt to cling on and charge fans premiership prices for the resultant mess, booing is the very least they can expect. I certainly agree with you about the pricing John. Let’s be honest I’m sure most of us can afford it but that’s not really the point, is it? There’s a track on the first Led Zep album called “Your Time Is Gonna Come” but Delia is doing her misguided damnedest to put that day off with the appointment of nephew Tom. He could potentially be around and in charge for another 40 years! I’ve nothing against the new football management structure whatsoever and I always wish us all the best on the pitch, but self-funding? That’s a giant no-no whichever way I consider it. It conjours images of the Del Boy approach to my mind. And tightens the grip also of course. Agree Martin. The problem with possession football is that more than other systems it is dependent on quality players. Manchester City have the quality to spend most of their time in the opposition half. The lower the quality of player the farther back the possession falls and it becomes less effective. Both Leeds and Swansea deploy the same tactics. They seem to be doing OK. I would hardly class either team to be far superior to ours. They seemed to have adapted quicker but our opening 4 games have proved that there are fine margins at this level. They haven’t got Tettey in midfield, he can’t pass hence we continually lose the ball. A good guy but not one for the possession game. They also have more legs hence more movement in midfield, qualities that are essential if you wish to play possession football. If it’s to work we need Thompson and Godfrey in midfield. I watched the Birmingham / Swansea match and that was another dire game. Seven Preston players between Leitner and the goal for his chance after his pass had set up after his pass had set up a clear route to goal for Hernandez. The club is trying to move forward but some fans want a long ball physical game which will keep us in this division as long as our neighbours. I don’t think booing was the answer, even if understandable, but a change was required because we could easily have lost this game, indeed probably would have if not saved by the crossbar. Tettey was having a nightmare so why not take him off for Godfrey or Thompson? These lads need to be given time on the pitch. Leitner needs to be moved upfield a bit to take advantage of his passing ability, Marshall was starved of possession and Hernandez moved to fullback. These players are worthy of top six if used properly. a person who actively helps someone. Never booed our own players and never will. If you boo then you are an opponent so go get yourself an away ticket or better still **** off! However, let’s all practice booing for the next two games reserved of course for our genteel and well-mannered opponents! Yes we have all possibly booed at some time or other especially in games that have been as dire as the first 75 minutes of Wednesday’s game. JohnF if as you say the booing was intended for the board surely as under previous regimes it would have been better to support the team during the game and direct the boos to the board once city the fame was over and outside the boardroom so everyone would understand who it was intended for???. Tettey has stated that part of the terms of his new contract was he would play every game as it takes his body longer to recover but has also said when asked to play he just can’t say no to the team, so maybe he will start on the bench. We now have a slight points advantage over the blue noses and lets hope we can increase that this weekend with at least a draw possibly Team Farke had one eye on this game during the run up to the Preston game so could we have a 3 man CB in this game it just might stem Dirty Leeds attacking threats. According to the locals in and around Poolfoot training ground in Fleetwood Wes has been seen with his agent, Being a free agent there is no rush to sign for any club so hopefully it is just seeing how the ground lies and it could also get other clubs higher up the leagues interested in him to open talks. Why hasn’t city shown any interest in loaning Harrison Reed looks like he will sign for Blackburn this weekend. Last season DH was let go to improve the coaching for the youth teams now they have recruited another ex city player with no coaching experience in Holt yes we all like to see ex players given a chance at the club but you would have thought Huckerby could have been kept in some capacity as well, but all the best to Holty at the club. Alex: re Harry Reed, wages mate. simple as and anyway as well as he did as a stand-in RB he didn’t fit into Farke’s plans in central midfield. As for Hucks the Club made a decision. Maybe on the role model platform? I don’t know. He’s very much still here in spirit though, for which I’m grateful. What a player he was! The only time I think it’s okay to boo our own player is when they have needlessly gotten themselves sent off, particularly if early in the game. Largely became they’ve let the rest of the team down. Otherwise it’s pointless. As for booing at half time, we’ll, I think that after a season of boring home football, and a half of absolute dross, I think booing the management is fair. I’m always stunned at the people who said they didn’t want Pulis, but are in love with the anti-entertainment football we play that sporadically gets results (on the chance someone pulls off a bit of magic). Wasn’t just booing at half time,when the ball went backwards twice in the second half the boo’s started.On the positive side when our players started running at defenders the crowd noise increased.Some fans are getting fed up with all the tippy tappy sideways style of play and after the opening 75 minutes of boredom on Wednesday who can blame them.